Coverage of the Haydenettes’ bronze-medal finish at the 2012 World Synchronized Skating Championships in Gothenburg, Sweden, is featured in the May issue of SKATING magazine. However, because of the magazine’s tight print deadline for the May issue, we were unable to get all of the skaters’ quotes and photographs in the magazine before it went to press. Below are some quotes from the Haydenettes, as well as some photographs of both the Haydenettes and Crystallettes from the World Championships. What did it feel like to win the bronze medal in Sweden? This is the team’s third consecutive World bronze medal. Does this solidify the U.S. as one of the top synchronized skating countries? How does the team feel about this year’s free skate? Slideshow pictures are courtesy of Alex Finn, Leslie Graham and Gail H. Mayer and are of both the Haydenettes and Crystallettes. Today has been declared ‘Team Braemar Synchronized Skating Day’ by Minnesota Governor Mark Dayton. Congratulations to Team Braemar on all they have achieved this season. Press release and certificate below. 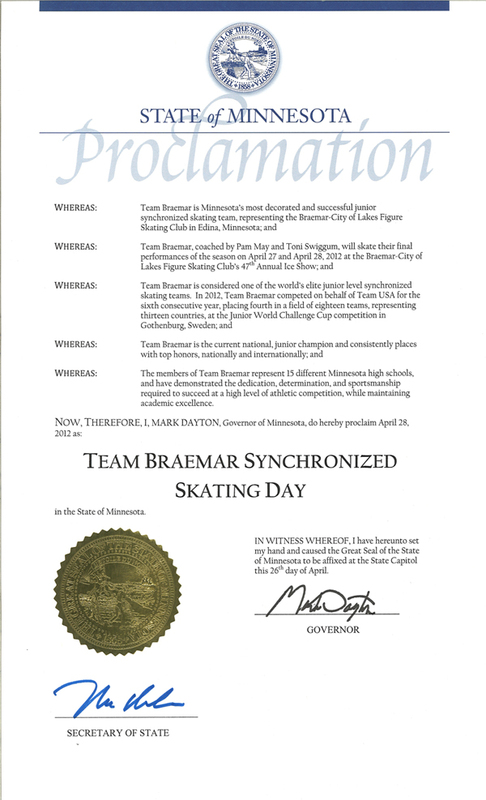 Edina, MN – Today, Minnesota Governor Mark Dayton proclaimed Saturday, April 28, 2012, to be Team Braemar Synchronized Skating Day. Team Braemar, the 2012 U.S. junior synchronized skating champions, represented the United States Figure Skating Association as Team USA at the 2012 Junior World Challenge Cup (JWCC) March 16-17 in Gothenburg, Sweden and earned an impressive fourth place. The JWCC is sanctioned by the International Skating Union and is comprised of elite teams from around the world. This was Team Braemar’s fourth consecutive trip to the prestigious competition. Coached by Pam May and Toni Swiggum and skating to a number titled “Blah Blah Blah Blah, Cha Cha Cha”, the team performed their short program to a crowd packed with fans from the U.S.. Said Co-Captain Breanna Hegseth, “Taking the ice was an indescribable feeling. The USA pride in the stands was unbelievable! Our short program was one of the best programs we skated all season!” The judges agreed, awarding the team a score of 49.94 and placing them in 3rd place after the short program. The public has the opportunity to watch Team Braemar skate their award-winning programs at the annual Spring Ice Show, which takes place at 6:30 p.m. on Saturday, April 28 at Braemar Ice Arena. Tickets will be available at the Braemar Ice Arena box office. The cost is $7 for adults and $5 for seniors and students. Tryouts for the 2012-2013 synchronized skating season will be held at 7:00pm on May 7, 2012 at Braemar Arena. For tryout information, visit braemarfsc.org or contact Jane Chaffee at jehchaffee@aol.com. Last week, the world came together in Tokyo as the top six figure skating teams of the season competed in the second ISU World Team Trophy. Team USA, comprised of Ashley Wagner, Gracie Gold, Jeremy Abbott, Adam Rippon, Caydee Denney and John Coughlin and Meryl Davis and Charlie White earned the silver medal behind the host country Japan. 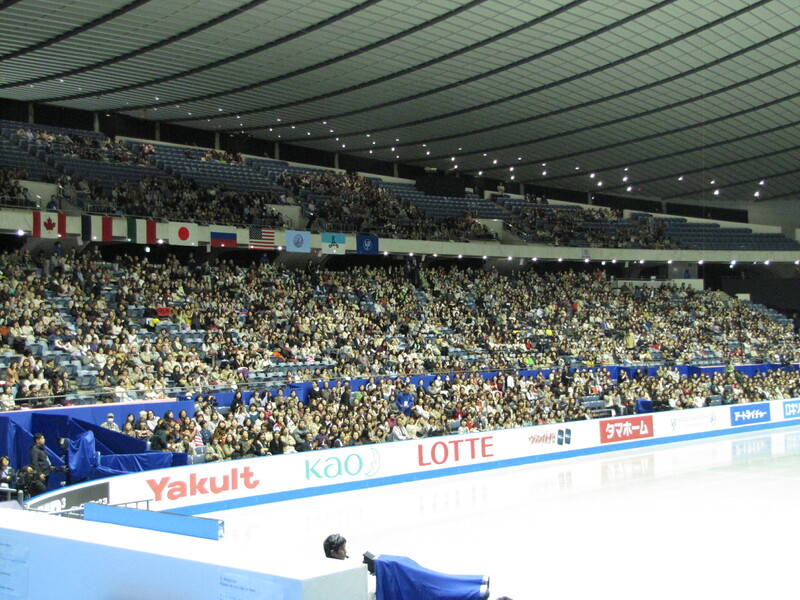 Courtesy of Renee Felton, here are pictures from Yoyogi National Stadium from ISU World Team Trophy 2012. Well, fans, it’s time to say goodbye to the 2011-12 figure skating season! The ISU World Team Trophy 2012 wrapped up today with Team USA winning the silver medal behind Team Japan. Team Canada grabbed the third spot on the podium after sitting in fourth place after the first two days of competition. The final day of competition began with the pairs free skate. Caydee Denney and John Coughlin, who wanted to “leave the season with a good taste in our mouths,” did just that by skating a clean program that engaged the crowd from the opening note. Their competition total was 175.98 points after receiving 117.05 for the free skate. Meanwhile, in the Kiss and Cry, Team USA was determined to amp up its team spirit. With the help of the World pairs champions Aliona Savchenko and Robin Szolkowy from Germany, Meryl Davis and Charlie White, Jeremy Abbott, Adam Rippon and Denney and Coughlin started the wave. 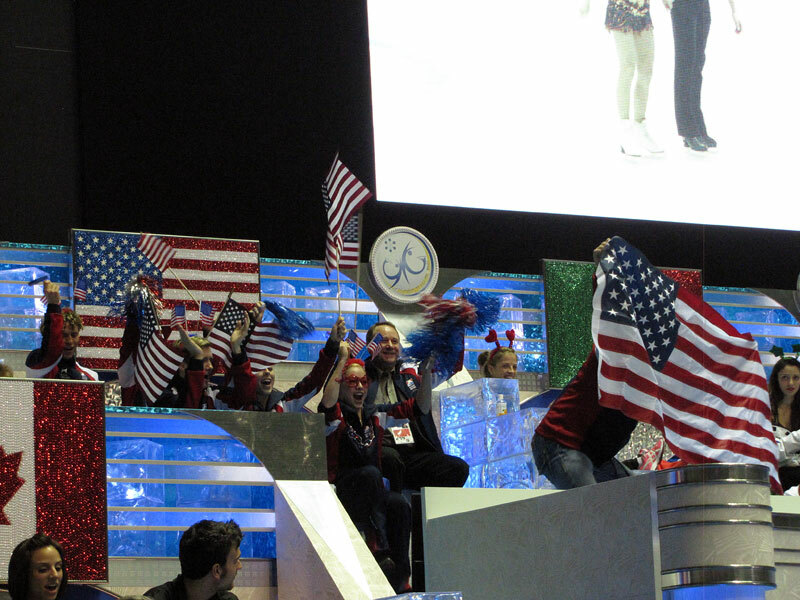 Denney and Coughlin finished fourth and earned nine points toward the U.S.’s final score. Russia’s Vera Bazarova and Yuri Larionov placed first with 180.70 points while Team Canada’s Meagan Duhamel and Eric Radford were second. Short program leaders Narumi Takahashi and Mervin Tran of Japan finished third. In the ladies event, Ashley Wagner, the 2012 U.S. and Four Continents champion, skated one of her best “Black Swan” free skates of the season, earning 122.29 points for the segment and 179.81 overall to finish third. Gracie Gold rounded our her senior debut by finishing fifth with a total of 169.65 points. She totaled 110.58 points for the free skate. After competing among some of the top senior skaters in the world, Gold has her sites on improving over the summer in preparation for her first full season at the senior ranks. The ladies crown went to Japan’s own Akiko Suzuki with World champion Carolina Kostner coming in third. On behalf of Team USA, thank you to our fans for your constant support. To the people of Japan, your hospitality and kindness is appreciated this week and always. Day 2 of competition from the ISU World Team Trophy 2012 proved to be as exciting and fun-filled as yesterday. Team USA is currently in second place with 51 points behind Team Japan with 59. Team France remains in third place with 44 points. Friday’s action kicked off with the pairs short program. Caydee Denney and John Coughlin, the 2012 U.S. champions, earned 58.93 points for their final “East of Eden” program of the season. They noted technical improvement from the World Championships – including earning a level 3 on their death spiral here, something that was scored as a level 1 at Worlds. Denney and Coughlin spent the rest of the evening cheering from the Team USA box. Coughlin is Team USA’s No. 1 fan, and he admits to thriving in the team environment. The pair is in fifth place going into tomorrow’s free skate. However, less than .40 points separates them from third place. The segment went to newly crowned World bronze medalists Narumi Takahashi and Mervin Tran of Japan with 64.92 points, while Russia’s Vera Bazarova and Yuri Larionov earned 62.02 points for second. Four-time reigning U.S. champions Meryl Davis and Charlie White won the ice dancing segment of this competition with a total score of 183.36. By virtue of their first-place finish in their discipline, Davis and White earn 12 points toward Team USA’s final score. Canada’s Tessa Virtue and Scott Moir finished second with 177.76 points, while Natahlie Pechalat and Fabian Bourzat were third with 167.83 points. The duo was clearly thrilled after their “Die Fledermaus” free dance, sharing a long embrace at center ice before entering the Kiss and Cry. Admittedly dissatisfied with their second-place finish at Worlds last month, Davis and White felt like they proved themselves in Tokyo. Hometown hero Daisuke Takahashi racked in a season-high 182.72 points for the free skate to win the men’s competition with 276.72 overall. Two-time reigning World champion Patrick Chan of Canada placed second with 260.46 points. 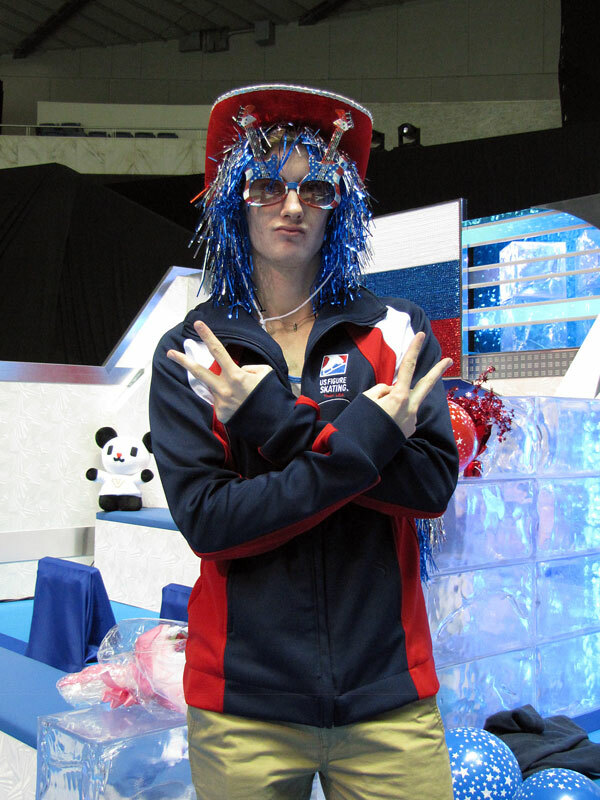 As for Team USA, Jeremy Abbott earned 147.39 points for his “Exogenesis” free skate, totaling 234.47 points for the week and finishing fifth. Despite some hiccups, Abbott enjoyed the program and is already looking forward to next season. Adam Rippon earned an international season-best with 147.80 points for free skate. His total score of 222.73 points also represented a season-high. Rippon, who finished seventh, is having a great time skating as part of Team USA. Abbott and Rippon earned 14 points toward Team USA’s total. The pairs free skate is set for 2:15 a.m. (ET) Saturday, while the ladies free skate will be the event’s competitive finale, with the ladies taking the ice at 3:50 a.m. Gracie Gold made her senior debut on Thursday and sits in fourth place, while Ashley Wagner, the 2012 U.S. and Four Continents champion, is in fifth place. The ladies field is led by Italy’s Carolina Kostner with 69.48 points and Japan’s Akiko Suzuki with 67.51. Denney and Coughlin – 2:30 a.m. Welcome to World Team Trophy 2012! 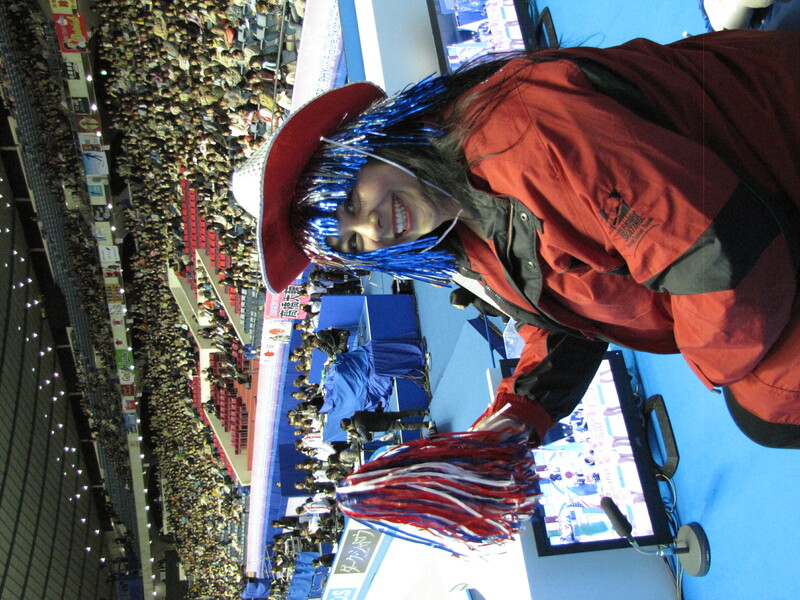 Everyone from skaters to coaches and officials to fans have caught the spirit of the event. Team pride abounds! Team USA is currently tied for first place with Team Japan (both teams have 45 points). Team France is in third with 35 points. The event kicked off with the short dance and Team USA was led by four-time reigning U.S. champions Meryl Davis and Charlie White. Skating their short dance for the last time, Davis and White earned 72.18 points and won the segment. Canada’s Tessa Virtue and Scott Moir finished second with 69.93 points and Natahlie Pechalat and Fabian Bourzat of France finished third with 66.57. After their performance, Davis and White expressed their desire to defend the title Team USA won at this event in 2009. Leading the men’s event is hometown hero Daisuke Takahashi, who earned 94.00 points for his “In the Garden of Souls” skate. He was the only skater to break the 90-point mark as two-time reigning World champion Patrick Chan of Canada placed second with 89.81 points. Gracie Gold made her senior debut, at an international competition featuring the world’s best no less, and earned 59.07 points to lead off the ladies short program. Her teammates offered hardy congrats as she came off the ice, with White telling her she made it easy to cheer. She is in fourth place. Ashley Wagner started her “Pollock” short program with a solid triple-triple combination. Despite a self-proclaimed “silly mistake” on her double Axel, Wagner earned 57.52 points and sits in place fifth place. Wagner expects her a strong come-from-behind mentality to propel her into the free skate, a program that has become a signature piece of her career. The ladies field is led by Italy’s Carolina Kostner with 69.48 points and Japan’s Akiko Suzuki with 67.51. Caydee Denney and John Coughlin kick off competition tomorrow for the U.S. with the pairs short program at 2 a.m ET, followed by the free dance at 3:25 a.m. ET and the men’s free skate at 5 a.m. ET. The ladies get a day off with the free skate coming as the event’s finale on Saturday. Denney and Coughlin – 2:14 a.m.
Davis and White – 4:17 a.m.